A digital certificate establishes your credentials when doing business or other transactions on the Web. 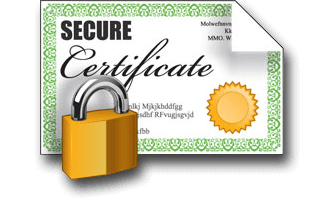 In simple words Digital Certificate is the attachment to an electronic message used for security purposes. The common use of a digital certificate is to verify that a user sending a message is who he or she claims to be, and to provide the receiver with the means to encode a reply. Digital Certificate provides a means of proving your identity in electronic transactions; just like a driver�s license or a passport does. You can present a Digital Certificate electronically to prove your identity or your right to access information or services online. The most widely accepted format for digital certificates is defined by the CCITT X.509 international standard. And the most widely used standard for digital certificates is X.509. As electronic commerce, electronic banking, and other online transaction are becoming more common, offering the convenience and flexibility to the government and business processes. However, it brings along the concerns about privacy and security of the electronic data transacted. Encryption of the data alone is not enough, as it provides no proof of the identity of the sender of the encrypted information. Thus the digital signature technology is used which makes the use of the digital certificate, which provides an easy electronic means of verifying sender�s identity ensuring the non-repudiation.